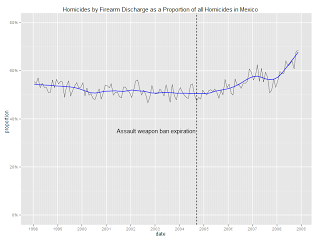 There has been a lot of attention paid to the role of US guns exacerbating the violence in Mexico. The assault-weapon ban expired on September 14, 2004, but with the recent spiraling of violence in Mexico the ban has attracted renewed attention. Just recently the Mexican President stood before the American Congress and blamed the assault weapon ban for the rising violence in Mexico, seemingly without proof. This post will try to clarify some of the issues surrounding the controversy. I think it would be fair to say that the conventional wisdom by scholars who have studied the ban would be the one Christopher Koper, Daniel Woods and Jeffrey Roth stated: “We cannot clearly credit the ban with any of the nation’s recent drop in gun violence.” In other words, the assault weapon ban had no significant effect—at least where the United States is concerned. And as far as I know there are no studies of the effect of the ban expiration on Mexico. For me [Rangel Sostmann] the solution is that Mexico and the United States must change their policies. And the policy right now is for the United States to send the money and weapons, and Mexico puts the dead and the drugs. And that ultimately is not going to work, it’s not a question of driving the Army out, the problem is that you have to change the policies, in this case the United States policy. Later an investigation by the National Human Rights Commission concluded that the army had used excessive force, impeded the investigation, planted weapons on the students, possibly tortured them for several minutes, and then shot them at point blank range. The day after the report was released, the ITESM bestowed upon the Secretary of Defense the “AdHonorem” award, given to persons whose works have contributed in an outstanding manner to the “the fight against injustice.” As you can see gun control has become extremely politicized, to say the least. 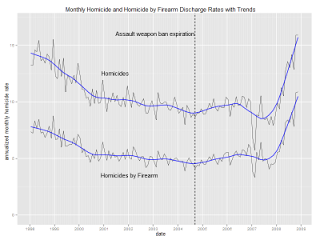 As you can see from the charts there was an increase in the number of homicides and homicides with firearm that coincided with the expiration. 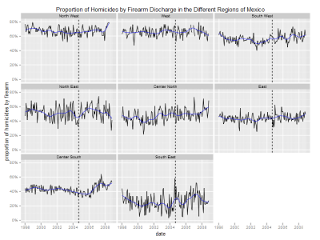 The big drop at the start of 2007 was due to the military operations in Michoacan and Acapulco, and also to a temporary drop in the homicide rate of Mexico City (which had nothing to do with the drug war). 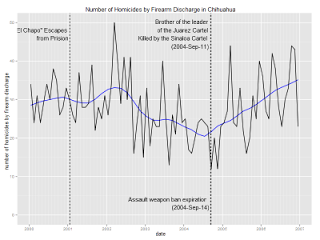 Notice how the proportion of homicides rose in North Eastern Mexico, though it would be fairer to say it was more of a temporary dip. 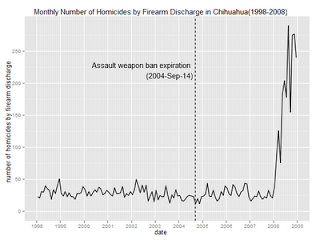 Also, there was a big rise in South Central Mexico long after the expiration of the assault weapon ban, this is the most populous region of Mexico. In the South East there was a big increase in the proportion a month before the ban went into effect. 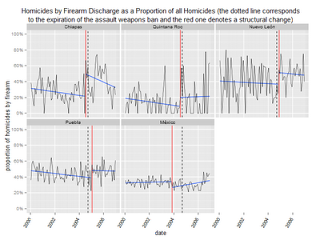 The chart shows that the proportion of homicides commited with a firearm did change around the time of the expiration of the assault weapons ban, but well within the normal range. The proportion didn’t rise outside the normal range until 2008. 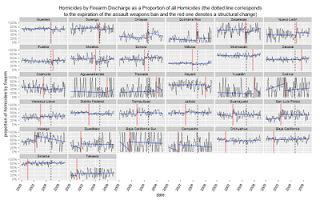 But remember how only the North East had a rise in the proportion of homicides commited with a firearm? 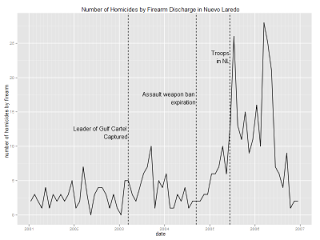 Wow, a big rise in homicides by firearm in Nuevo Laredo that coincided with the expiration. 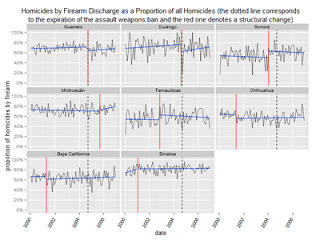 Plus, before the ban the number of monthly homicides was low, which would explain why the variance in the proportion chart was so much greater before the ban. It looks like there was indeed an effect independent of the capture of Osiel Cardenas and the arrival of the army. The changes in Guerrero and Durango are clearly not significant, and are in fact slight dips. Since the state of Tamaulipas shows no signs of the rise in violence in Nuevo Laredo, it must have been a localized phenomenon, at least in that state. However in Chihuahua there’s another big confounding variable in that the leader of the Sinaloa Cartel ended his alliance with the Juarez Cartel by killing Rodolfo Carrillo Fuentes, brother of the leader of the Juarez Cartel a couple of days before the ban expired. Supposedly after “El Chapo” Guzmán escaped from prison he began to rebuild his drug empire and sometime thereafter entered into a non-aggression pact with the Juárez Cartel, but on Sep 11, 2004, he ended the alliance by killing the brother of the leader of the Juarez Cartel, since neither the proportion or the number of homicides committed with a firearm changed in Ciudad Juárez, my guess is that the breaking of the pact had more to do with the rise in violence than the assault weapon ban. No effect. 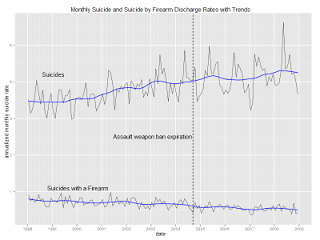 There’s a very interesting seasonal pattern, and the fact that the suicide rate has been rising while suicide with firearm rate has been decreasing would go against the conventional wisdom that the availability of firearms increases suicides. 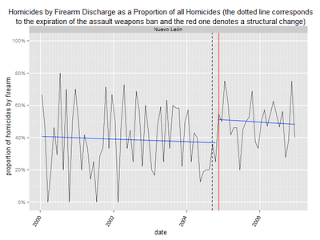 This, of course, doesn’t concern the effect of expiration of the ban on assault weapons so I’ll leave it at that. 90% of the guns in Mexico come from the US: Of those traced, about 90% came from the US. The keyword being traced. This isn’t all guns that were confiscated in Mexico, not even a random sample, but a highly biased one. For example, according to GAO, 25% percent of traced guns were assault weapons, while according to the Mexican government 50% of seized guns were assault weapons. So it would be mistaken to draw inferences about where the total percentage of guns come from. However, given that thousands of guns have been traced to the US, it would be correct to say that the United States is one of the main suppliers of guns to Mexico. Assault Weapons are “Military Grade”: None of the assault weapons for sale to civilians in the United States are of military grade and with the exception of some collector items they are all semiautomatic. They deliver one round each time you pull the trigger. In a fully automatic weapon many bullets can be fired with one trigger press. “Cop Killer” Guns: Some bullets can pass through body armor; however, they are not for sale to civilians. For some reason drug dealers took to calling the guns that can fire this kind of bullet “Cop Killers,” even if they can only load them with regular bullets. The Assault Weapon Ban also prohibited magazines that held more than ten rounds. The law did not ban the possession or sale of pre-existing assault weapons or magazines. As a consequence pre-ban assault weapons and magazines rose in price until the ban ended. In response to the ban, firearm manufacturers quickly retooled their guns so that they didn’t meet the law’s definition of assault weapon, and most of the banned features don’t strike as particularly important. For example, I bet most guns smuggled to Mexico are disassembled and so a stock of any kind would be removed. And I’ve never heard of a cartel shootout that involved bayonet mounts. However a recent analysis by the Texas Ranger’s Border Security Operations Center highlights the importance of high capacity magazines.Unlike assault weapons, high-capacity magazines, which are used with many guns, have been selling briskly since the ban ended because prices have dropped considerably. It is very common to find live ammunition rounds strewn on the ground after drug cartel shootouts (examples: 1<_a> 2<_a> 3), reloading a gun when other people are shooting at you is not an easy task and cheap large capacity magazines are an advantage during long shootouts, like the ones that occured in Nuevo Laredo when “La Barbie” was trying to take it over from the Gulf Cartel. This would be one plausible mechanism through which drug cartels could have benefited from the expiration of the ban. 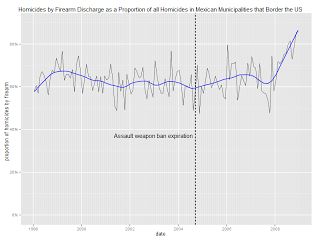 And for Nuevo Laredo I have no recent homicide data, which is a real pity since it wouldn’t look ridiculously low, here’s a chart comparing it to other border cities, you can see how it stands out in 2005 and 2006. During 2010, in Tamaulipas there were 338 drug related homicides during the first half of the year according to the Reforma newspaper, during all of 2005 there were a total of 351 homicides (all kinds). 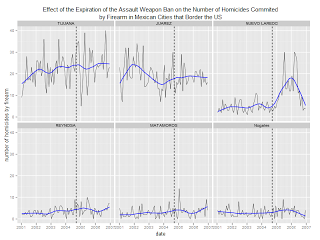 I can only surmise that the whole state of Tamaulipas and Nuevo Laredo are much more violent now than in 2005, even if the difference is not quite as stark as in other regions of Mexico. 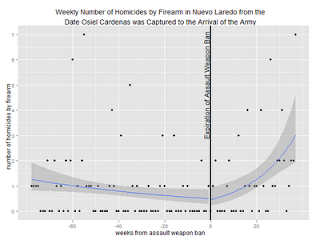 I modeled the effect of the assault ban as a Zero-Inflated Poisson regression model predicting the number of homicides that occurred daily in Nuevo Laredo from the time Osiel Cárdenas was captured to the time the army arrived. The model with a breakpoint ocurring at the time the assault weapon ban expired proved superior to one without a breakpoint. 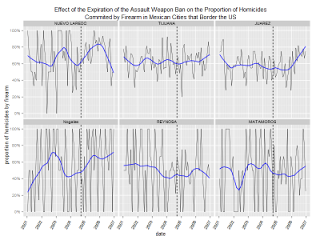 Certainly the assault weapon ban wasn’t the only variable that contributed to the rise in violence: A weak and inept government, a large Mexican-American population willing to smuggle guns (Edgar Valdez Villareal “La Barbie” was born an raised in Texas), the corruption of the public security forces of Mexico, and the weakening of the Gulf Cartel with the capture of Osiel Cásrdenas also played a big part. But the capture of Osiel Cardenas occured more than a year before the violence started, the army arrived more than six months after the violence started, there’s a plausible advantage to having cheap high capacity magazines, and the rise in homicides coinicided with the expiration of the ban. 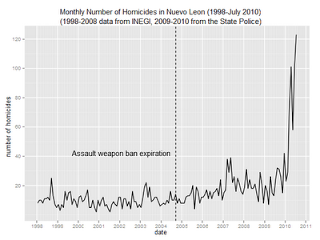 I can only conclude that the expiration of the Assault Weapon Ban contributed to the violence in Nuevo Laredo with possible spillover effects in Nuevo León, and I’ve certainly updated my beliefs about the effect of the Assault Weapon Ban. 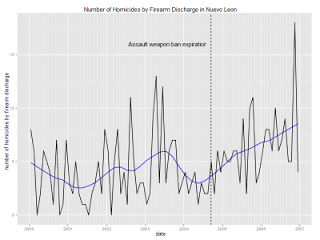 Clearly much work remains to be done, more complex models could be fitted to the data and I didn’t answer all the questions of interest: I didn’t perform a detailed analysis of the change in proportion of homicides by firearm in Nuevo Laredo or an analysis of what happened in Nuevo León, but given that “La Barbie”, the guy in charge of taking over Nuevo Laredo, was caught on Monday, finding out the whether he took advantage of the expiration of the assault weapon ban should be a simple matter of asking him.